No 28 Lios an Uisce. Keane Mahony Smith presents to the market No 28 Lios an Uisce, a wonderful four bedroom semidetached residence in close proximity to all city amenities. The property is located close to GMIT, Merlin Park Hospital, Galway Clinic, Bon Secours, the new Garda HQ, and a host of employment hubs on the east side of the city. There is a regular bus route to and from the city centre. No 28 Lios an Uisce is positioned in a quiet corner with only one other owner occupied property adjoining, and excellent car parking. This property offers the purchaser an excellent opportunity to buy a wonderful property in turnkey condition, ideal for family living or a gilt edged investment property. No 28 features contemporary light grey porcelain tiles which connect the entrance hall, kitchen/dining and utility. The living room has wood flooring and a feature open fireplace. The bright kitchen/dining area has fitted kitchen units, fridge freezer, dishwasher. There is a large utility with an abundance of storage space and room for clothes washer/dryer. Access to the rear garden is via the utility. There is new carpet laid throughout the first floor — stairs, landing, and bedrooms. On this level there are four bedrooms, each with built-in wardrobes, master en suite, and fully tiled family bathroom. The accommodation comprises entrance hall, living room, kitchen/dining, utility, and downstairs we on the ground floor. On the first floor, there are four bedrooms, one en suite, and main bathroom. No 28 Lios an Uisce ticks all the boxes as a family home or gilt edged investment property due to its truly excellent location. 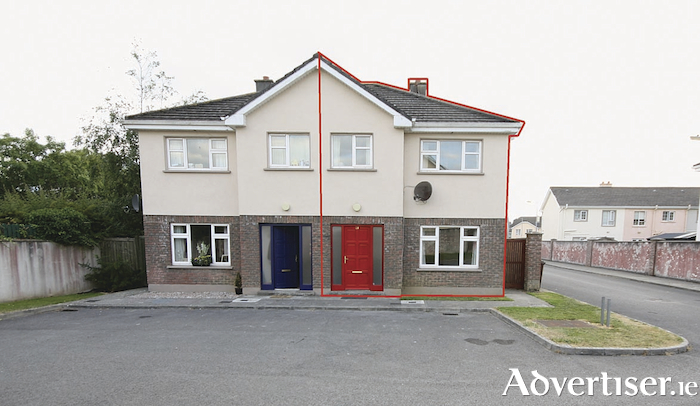 Viewings are by appointment only with Keane Mahony Smith on 091 563744.